The first Young Adult Cardiac unit in the country, to provide care for patients with congenital heart problems, that are too old for the Paediatric ward, but aren’t comfortable with the mainly elderly adult ward. 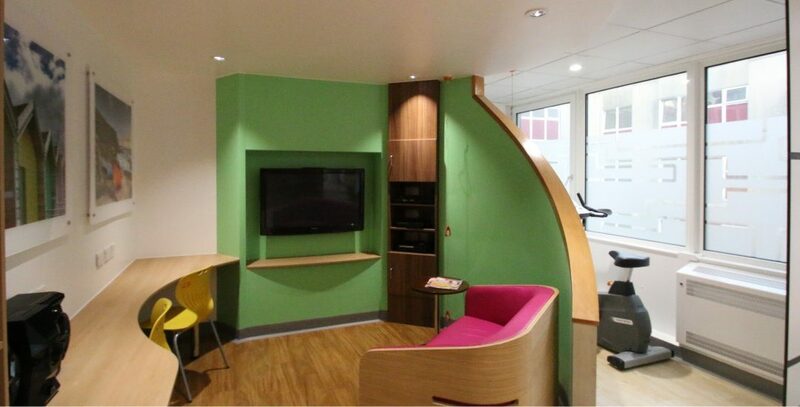 Partially funded by the Wessex Heartbeat charity, this was a full strip out of an existing ward area, to create an enhanced environment for these patients. Not a Home from Home, but somewhere special that felt less like a hospital. We were asked to create lively spaces for 17 beds. 4 in Single rooms and the rest in multi bays up to 5 beds. The single rooms also had to cater for a parent or guest to stay overnight. We had to create some patient escape rooms for them to serve their own food or just eat communally and a lounge to relax or exercise in. The Lounge was split into different zones so people could relax quietly, play video games or use the exercise bike without intruding on others. Within the rules of Infection Prevention, the sanitary fittings were adjusted to feel more like a hotel and full poster images included in the bathrooms. Custom made wallpaper and patterned window frosting was used, along with a palette of materials to make it feel different to the rest of the hospital. Ironically, all the other wards now want to match it. The unit was officially opened on 28 Jan 2015, by the Countess of Wessex.